I've been all about soup lately. Rob isn't really a big fan, unless it's Tomato Soup. However, he loves the canned congealed version of tomato soup, which, I'm sorry, is just not going to work for me. I'm not a huge fan of tomato soup, and I'm pretty certain that the canned version is why. Maybe it's good, but I'm not going to find out - not if I have to open the can at least! Same reason I have a hard time with cranberries, because I've seen too many canned cranberry sauces as well. 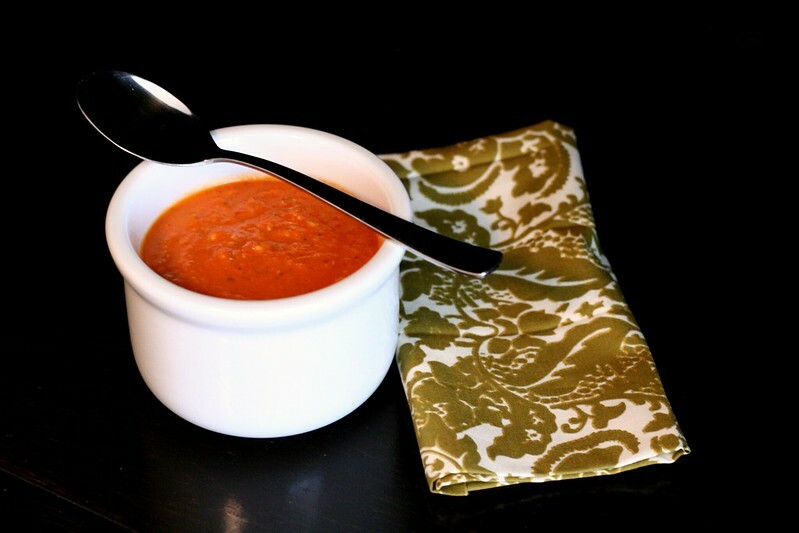 The subtle heat from the fire roasted tomatoes and the full flavor from the basil and garlic really add a lot to this soup. I only made half a batch but I would imagine this freezes really well also! In a heavy bottomed pot over medium high heat, saute onion in olive oil until translucent. Add 5 cloves of chopped garlic and saute with the onion for 2 minutes. Add the tomatoes and their juice to the pan and cover for 15 minutes, stirring as needed. Add the chicken stock and half and half, bringing to a simmer. Cook uncovered for 10 minutes of until it has thickened. Add the remaining garlic, crushed red pepper, basil and season to taste with salt & pepper. Lower your heat to medium-low and cook for 5 minutes. Using an immersion blender, or carefully transfer soup to a blender/food processor, puree soup until there are no large chunks of tomato left. Serve immediately. I love a good tomato soup! Looks good.